One of the earliest stories children hear is the familiar tale of Cinderella. While there are hundreds of Cinderella narratives from dozens of cultures, the most common one in American households is the version that traces its origins to French author Charles Perrault’s 1697 Histoires ou contes du temps passé, Cendrillonin, in which a kind, gentle, and usually white girl lives with her cruel stepmother and stepsisters, goes to the ball with the help of a magical fairy Godmother, and is rewarded with marriage to a handsome prince. This is the one presented in the curriculum I teach in the Kings and Queens domain. I struggle with reading this version to my kindergarten class for several reasons. Cinderella’s main quality is kindness, an important characteristic we want children to develop, but one that is not sufficient in overcoming the oppressive situation she is in. Ultimately, her problems are solved by magic, not by any action or organizing on her own part. There is only one “winner” in the story, as there is no community that Cinderella uplifts alongside her. Finally, the prize at the end is marriage to a royal prince who she barely knows. While this all makes for a fun and entertaining story, I believe we as teachers need to be thoughtful about what lessons and values are conveyed through the literature we select. So, in an effort to highlight diverse narratives and broaden my students’ thinking about this tale, my co-teacher and I opted not to read the original story, and instead chose four different versions of the Cinderella story: The Rough-Face Girl by Rafe Martin (an Algonquin Indian story), Mufaro’s Beautiful Daughters by John Steptoe (a Zimbabwean story), Chinye: A West African Folk Tale by Obi Onyefulu, and Prince Cinders by Babette Cole (a white American version). I want to be clear that none of these four texts is a perfect anti-bias, feminist tale. Three of the four end in a “happily ever after” marriage to a royal being that the protagonist barely has a relationship with prior to the marriage. Chinye is my favorite of the ones we read because (spoiler alert) it ends with Chinye uplifting her community with her by sharing her new wealth, and (gasp!) there is no love story! It is a mixed bag when it comes to how active of a role the protagonists take in overcoming their struggles. While kindness remains a central theme (except in Prince Cinders, in which he does not have much of a personality at all), I would argue that the characters display more qualities than the original Cinderella. Nyasha (in Mufaro’s Beautiful Daughters) showed generosity, Chinye exhibited self-discipline, and the Rough-Face Girl showed resourcefulness and resilience. All four of the stories we read lent themselves to two academic skills we have been working on, retelling and sequencing events in narratives. After listening to and discussing each story, students wrote and drew the beginning, middle, and end of the story. So while these texts are considered supplemental to the curriculum, we used the texts to teach and practice important reading skills in kindergarten. Students retold the stories through discussion, writing, and drawing. We also voted on two stories (they chose The Rough-Face Girl and Prince Cinders) to dramatize through a play. How was the problem solved? What was the reward at the end? 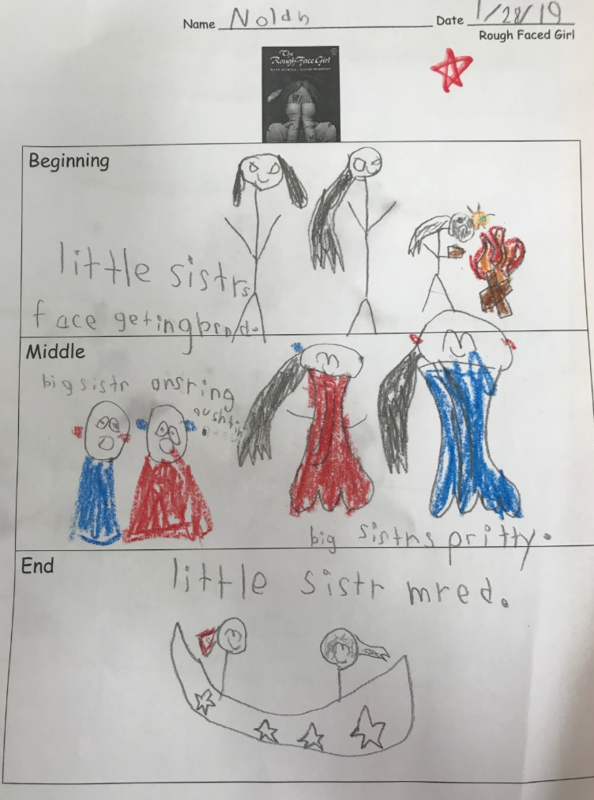 Across all four stories, students recognized that mean family members was a common thread, and that their solutions all involved the main character being kind and having some magic help them along the way. The theme of kindness resonated strongly with students. When I asked how else their problem could have been solved, the main solution they identified was that their siblings should have been more kind in return. I probed them further, pointing out that “we can’t always control how others behave, so what are things the main character could control that might have solved their problem?” This pushed students to point to solutions like letting an adult know what’s going on, asking for help, telling the person who is mean to you “please stop” or “I don’t like that.” These ideas are foundational to skills like organizing and advocacy. We also discussed the gender roles in the stories. My students loved Prince Cinders — mostly because it is very funny and silly — but they also pointed out that the gender roles can easily be flipped. We challenged the idea that girls must be the ones who have a problem that needs to be fixed. As educators, we are often confronted with a dilemma: do I continue to teach the same stories that have been passed on for generations, or do I challenge the curriculum by integrating diverse narratives? And when stories have problematic elements, how can I unpack them with young children? Most of my students have already heard the familiar Cinderella story by the time they get to my classroom. My hope is that reading diverse versions of the tale and engaging them in discussion offers them windows into other narratives, mirrors to see themselves reflected, and the critical thinking skills to start to think about the messages they are learning. Ashley Chu is a member of the D.C. Area Educators for Social Justice (DCAESJ) Anti-bias Education Working Group. She teaches Kindergarten at Center City Public Charter School in Washington, DC. She has been working in early childhood education for eight years.